It doesn't get much better than a weekend or vacation camping and golfing and Texas is home to several RV parks and campgrounds that have golf courses and other parks that have a stay and play package with a nearby golf course. 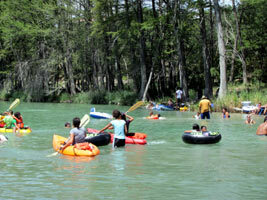 Here is our list of the best camp and golf stay and play in Texas and just across the border. Some of these RV parks also have some cozy and quaint cabins that are perfect for a fun stay and play if you don't want to camp. Make sure you ask them if they have a Camp and Golf Stay & Play Package to save yourself some money. 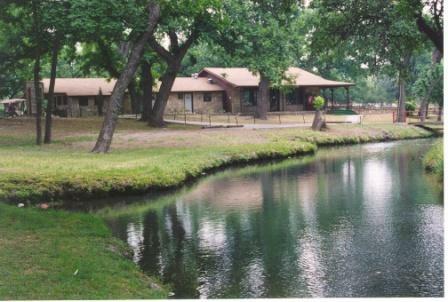 Bastrop State Park, one of Texas Outside Favorite Parks, is situated among tall pines and rolling hills and includes cabins, RV pull through sites, tent sites, and a small 10 acre pond for fishing. The park also has a store, swimming pool, playground, 8.5 miles of hiking trails, 13 miles of surfaced road for road bikes. Our review of the park will tell you why we made this one of our favorites. The course is very dated, built in the 1930's, and typically not in the best condition. The front nine is the original nine and not very exciting - fairly flat and traditional with a couple fun holes. The back nine was built in late 1980 and is a lot more fun with rolling hills and challenging holes. Read our review of Lost Pines Golf Club. Located on the banks of the Llano River, this Resort is a perfect place to stay to explore Llano and the nearby Hill Country. You can play golf at Llano River Golf Course; spend a day in the adjacent park swimming, fishing, tubing, or hiking along the river. You will also enjoy nearby restaurants, wineries, and hill country attractions. 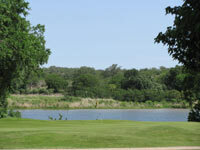 Read our review of Llano River Golf & RV Resort. Llano River Golf Course is a pleasant surprise - a bargain, pretty good conditions, some challenging holes, scenic, and fun to play. The back nine has rolling hills with scenic views, elevated tee boxes, up hill as well as downhill shots, and ravines and valleys to cross. Read our review of this course. Northpoint Landing RV Park overlooks the 13th and 14th fairways at Lighthouse Country Club - an excellent course which was rated 9.1 out of 10 by TexasOutside.com. 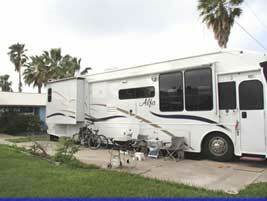 The RV park has 24 full hook-up sites with level concrete parking pads plus a separate car parking pad. You can walk to the Pro Shop, practice facilities, and Clubhouse restaurant. And you're two minutes to Lake LBJ. Lighthouse Country Club is a rare find and a unique golfing experience. It's home to some very fun and interesting holes, near perfect conditions, superb greens, and extremely reasonable rates. 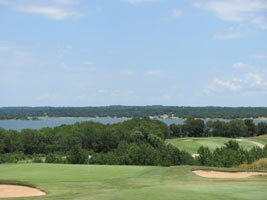 Read the review of Lighthouse Country Club to learn more about this hidden Hill Country gem. Conveniently located between Austin and San Antonio and on the edge of New Braunfels, Hill Country Cottage & RV Resort is a perfect place to stay and enjoy all that the area has to offer some of which includes Gruene Hall, tubing the Guadalupe River, great restaurants, lively nightlife, Schlitterbahn waterpark, and golf. 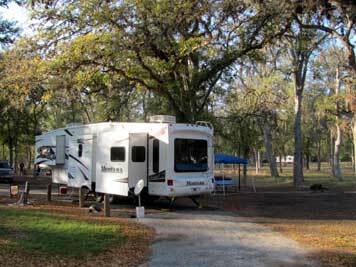 They have full hook-up RV sites, lots of cozy cabins, and plenty of amenities. 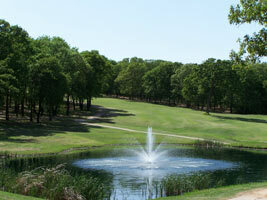 They also have a stay and play package with one of the best courses in the area - Landa Park Golf Course at Comal Springs. 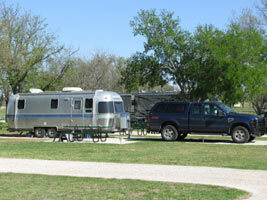 Read our review of Hill Country Cottage & RV Resort. They have a special offer for Texas Outside visitors - print this Hill Country Cottage & RV Resort Coupon to save some money. Landa Park Golf Course received a $7 million dollar renovation in 2014 which turned what was a flat and traditional course with average conditions into a superb layout with some great holes and near perfect conditions from tee to pin. The course is now loaded with some fun holes, lots of character, some opportunities to test your game, and a new bar and grill. Watch out for the deer and tubers! 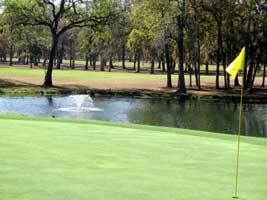 Read our review of Landa Park Golf Course at Comal Springs to learn more. Print this Landa Park Golf Course Golf Coupon to save some money on your next round. Tucked under some stately oaks and just outside of San Saba, this small city owned RV park is next door to the golf course (from one site you can watch golfers try to putt for par), has heavily shaded back-in sites, full hook-ups, and some shaded to open pull throughs, restrooms, and a club house.Read the review of San Saba RV Park Review. A very pleasant surprise - good conditions, some fun holes, heavily treed fairways that demand accuracy, friendly service, and an excellent value. 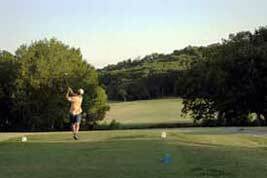 To learn more about this hidden gem, read our review of San Saba Golf Course. 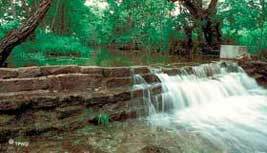 Garner is the oldest State Park in Texas and one of the most popular because it's right on the river with a deep swimming hole, good tubing near by, rope swings, and a large picnic area. There are lots of sites ranging from primitive to water and electric sites, screened shelters, restrooms and showers, hiking trails and more. Ok, so it's only a miniature golf course, at least you can play golf with the kids and practice your putting before you head out to play the real deal. The Club at ConCan is just down the road and it is a fantastic 18 hole championship golf course - read our review of The Club at ConCan. The picture on the right is one of the holes at their course, not the miniature golf course! There are campsites with water and electricity; as well as full hook up sites with and sewer; 1.5 miles of hiking trails; a recreation hall with restrooms, a patio, a picnic area, playground equipment, and a kitchen with a stove and a refrigerator available; and a swimming pool. Plus you can fish in Clear Fork Creek that runs through the park. From your campsite, you can watch fellow duffers try their best to par some of the 9 holes on this course. Most of the holes are traditional and straightforward but you will find some that could challenge your shot making. Carts are available for rent. A good course for a family outing at reasonable prices. 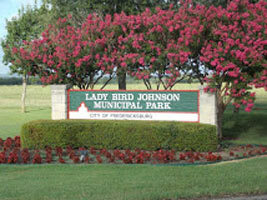 Lady Bird Johnson RV Park is a 90 site park that is about 2 miles from downtown Fredericksburg. The RV park has a playground, showers, and a dump station and it's part of a larger park with an 18 hole golf course (less than a quarter of a mile away), creek and lake with huge catfish, pavilions, picnic areas, and a couple baseball parks. The Park is situated next to the airport and you can watch planes take off and land. What a pleasant surprise - it is fun, challenging, and in great shape. The front nine is really unique and different with forced carries, elevation changes, and some tricky holes.The back is more traditional and straightforward. Rates are very reasonable, the clubhouse has a good grill and the practice facilities are good. 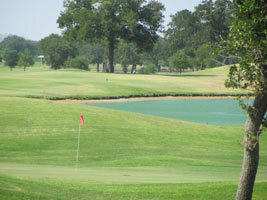 Read our Review of Lady Bird Johnson Golf Course. This is an excellent State Park and one of our favorites. It's got some fun and relatively easy hiking and biking trails some of which are along the Brazos River, tent to full hook-up pull through sites, lots of wildlife, restrooms and showers, and a few other amenities. 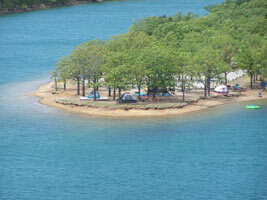 Read our review of Stephen F Austin State Park. Just outside the entrance to the State Park, this is another hidden gem. Some very fun and demanding holes, forced carries, some ups and downs, lots of trees to avoid, dog legs, and more. Conditions were good and the rates were very reasonable when we played. Review of Stephen F Austin Golf Club. Lake Park is across the street from Lake Park Golf Course and it has full hook-up sites, restrooms and showers, and is home to a lot of monthlies. 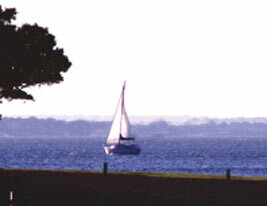 The park also has easy access to Lake Lewsiville and a boat ramp - a good place to camp and boat. Lake Park Golf Course gets a lot of play because it typically has good conditions and very affordable rates. It's a flat and open track but wind, water, dog legs, and more can make it fun and demanding. Review of Lake Park Golf Course. Winter Texan's heaven with over 200 back in and pull through full hook up sites, plus lots of amenities including horseshoes, meeting and activity center, pool, laundry room, and a wide array of activities some of which include dinners, pool parties, beach parties, professional shows, bowling, mixers, luncheons, theme parties, bingo, potluck, cards, shuffleboard, Spanish Lessons, Computer Lessons, crafts, breakfasts, and more. No golf course, but across from the office is a driving range - does that count, it does if it's free and you need to warm up for the real stuff.. At least you can warm up and then go play one of the Rio Grande Valley's great courses. See the link below to read our reviews of some of the best courses in the Rio Grande Valley, you'll be pleasantly surprised at the number and quality of the courses. A huge bend in the Rio Grande River borders the resort and golf course and provides the property with a lush tropical setting. This is a 55 and over retirement RV park with a limited number of RV sites available plus a pool, spa, activities, shuffleboard, tennis courts, laundry and bath facilities. Very nice sites and the Resort is well landscaped and maintained - a fantastic place to stay in the Valley. Wow, what a pleasant surprise and a fantastic course. Rated by Golf Digest as a "Best Places To Play, River Bend is home to some excellent and memorable holes, very good conditions, and rates so low that this is a must play course if you're in the valley. You'll find a little bit of everything on this course - forced carries, raised greens and tee boxes, wide to tight fairways, and more. "Read our review of River Bend Resort Golf Course. 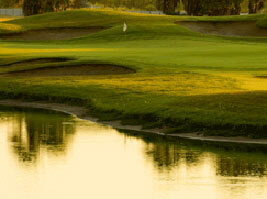 Surrounded on two sides by the Monte Cristo Golf Course, it's just a short walk from your RV site to the golf course. They have golf packages, reasonable rates, full hook-ups, a pavilion, and free Wi-FI. A very traditional and straightforward layout with water on 11 holes, wide forgiving fairways, and excellent greens. All of that plus reasonable rates, an excellent opportunity to score well, and good service mean that you should give them a try. Read our review of Monte Cristo Golf Course to learn more. Llano Grande is a huge park loaded with excellent amenities (pools, tennis, pickleball, fishing, club houses, events, activities, and lots more), well landscaped RV sites, and cabins. 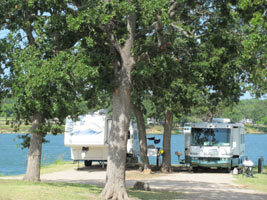 Read our review of Llano Grande Lake Park Resort & Country Club to learn more. An historic 1928 Club House is home to the pro shop on this par 72 18 hole course. Llano Grande Golf Course plays like a links style course with wide open fairways, small greens, and water on 11 holes - including an island green. Good conditions, reasonable rates, and an opportunity to turn in a good scores. 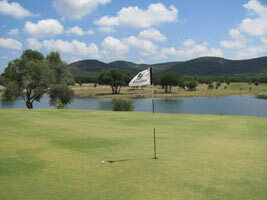 Here is a link to our review and rating of Llano Grande Golf Course. 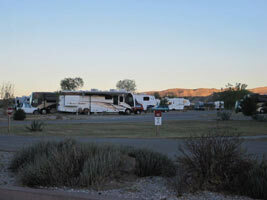 Mission West RV Park has over 200 full hook-up RV sites, most with lots of shade. The Park has El Nino Golf Course within walking distance from each of the sites. Some of the other amenities include: a heating swimming pool and hot tub, rec room, restrooms, horseshoe pits, and more. 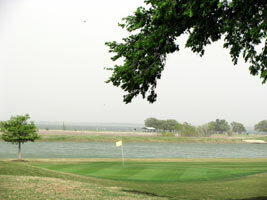 El Nino Golf Course is a 1285 yard, 9 hole par 3 course located in Mission West RV Park in Palmview. Tight fairways, palm and other trees, and small greens mean you need to be accurate to score well. El Nino is not in the best condition but it's only $8 which includes a pull cart. A course where you can practice your short game. Not the best conditions but it's only $8 which includes a pull cart. Across the street from this RV park is one of the best resorts in Texas (Lajitas Resort) which is loaded with amenities you can use when you stay at Maverick RV Park. Full hook-up back in and pull through sites, swimming pool, clubhouse, and more. 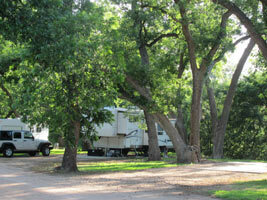 Read our review of Maverick Ranch RV Park and check out this coupon to save some money. Wow, you need to add this course to your bucket list - there is nothing like it in Texas. Dramatic elevation changes; stunning majestic views of mountains, desert, Rio Grande River, and deep into Mexico; fun, unique, and very challenging holes; and an absolute blast to play. Read our review of Black Jack's Crossing. A desert campground with full hook-up pull through and back-in sites plus a motel, cabins, a house sitting on a bluff, restaurant, restrooms, and showers. 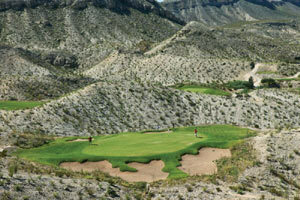 And it's close to Big Bend National Park and has riding stables a nine iron away. 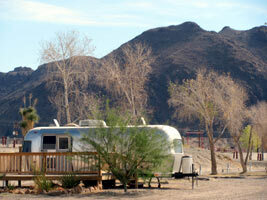 Read our review of Big Bend Resort's RV Park. A true desert course where it's hard to tell the difference between the fairway and the desert. Some have labeled this the "hardest mile of golf in Texas" and you're likely to loose or maybe find plenty of balls. No green fee charges, you just pay for a cart. 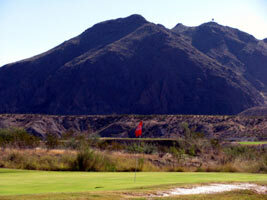 Here is a link to the Review of Big Bend Resort Golf Course. The Park has 85 full hook-up sites, including cable TV and wireless Internet in the Day Room and in limited areas of the park . Telephone connections are available at each site. The Park has 4 bathrooms, showers, kitchen, day room and laundry room. The Day Room provides a telephone, TV, library, and direct connection to the Internet. Tent camping, with nearby cold showers is available to all travelers. Huge oak and pecan trees surround the area. BBQ cooking facilities and picnic tables are located at each site, and a large community fire-pit. This is one of our favorite across the border parks - great sites on a beautiful lake, fantastic bike trails, a great golf course, frisbee golf, a lodge, cabins, and more. Some of the sites are full hook-up, some are under the trees, and some are right on the water of this beautiful clear lake. Read our Review of Lake Murray State Park. A pretty interesting layout with some challenging holes. Typically not the best of conditions but the rates are reasonable and there are some fun holes that demand accuracy over distance. Lots of trees, dog legs, water, and a couple risk reward shots. Read our review of Lake Murray State Park Golf Course. If you're heading to Lake Texoma or looking for a good place to camp on Lake Texoma, then Lake Texoma State Park is perfect. There are tent sites, back-in and pull through full hook-up sites, cabins, and more - and best of all, some of the sites are right on the water. There are boat ramps, restrooms and showers, and a fun and lively cantina. Wow, what a fantastic track with scenic views of Lake Texoma, elevation changes and lots of ups and downs, and lots of fun and interesting holes. The conditions are normally very good, the course demands good course management and club selection skills, and the rates are reasonable. 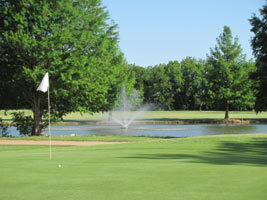 Read our review of Chickasaw Pointe Golf Course to learn more.